A fresh egg, with a clean, smooth, brown or white shell, a pure, deep-yellow yolk and a translucent, firm white � this is the ideal of the egg producer and the consumer. How can producers make sure that hens lay more eggs like this, and fewer with shell or internal defects? The Optimum Egg Quality Handbook describes 15 shell defects and 9 internal defects, each illustrated with a colour photograph. It explains the possible causes and corresponding control measures for each defect. 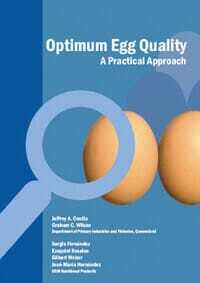 Egg producers and anyone else interested in poultry management will find this book a comprehensive, yet clear, simple and practical guide to improving egg quality. � The State of Queensland, Australia (through its Department of Primary Industries and Fisheries) and DSM Nutritional Products Ltd., 2007. No part of this publication may be reproduced, copied or transmitted save with prior written permission of Director, Intellectual Property Commercialisation Unit, Department of Primary Industries and Fisheries, GPO Box 46 Brisbane, Queensland, Australia 4001, and DSM Nutritional Products Ltd.